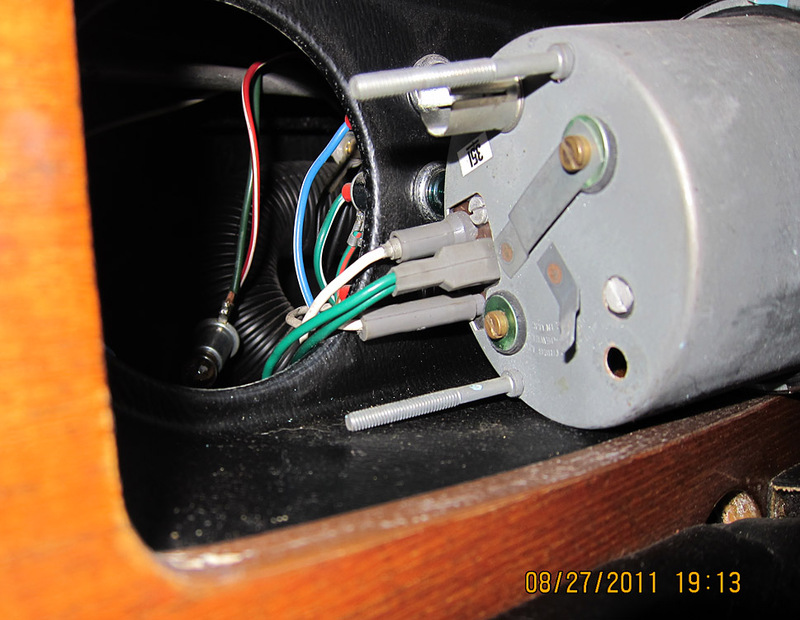 Unless you have extensible thin arms, with eyes in your fingers, you need to remove the dash to get the bulbs out, apart from speedo and tach. I upgraded my instrument lights, but they are still dim by modern standards. If they're working and you can see the gauges, I'd leave 'em be! 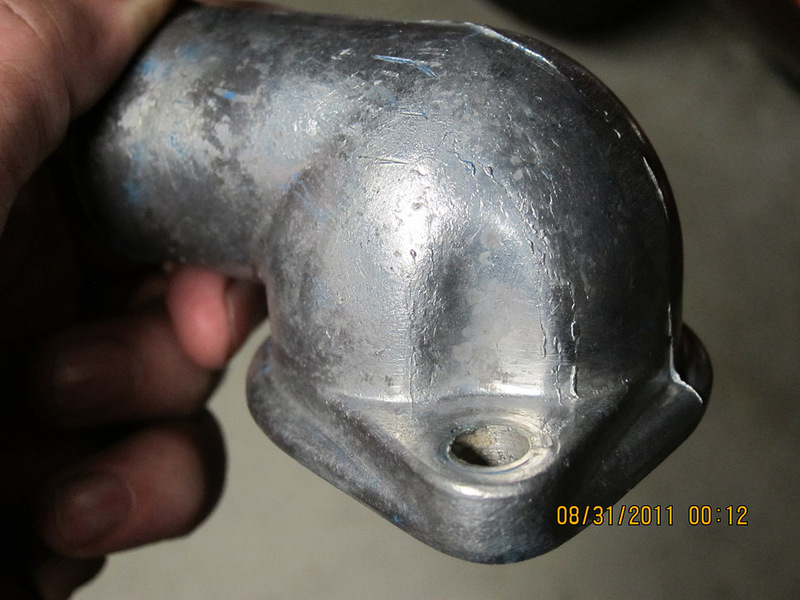 Well....being the "I know I can fix it" kind of guy I am, I went ahead and looked under the dash on the driver's side. I can't say I wasn't warned.... lol. To my surprise, there hanging down was a ground wire connected to nothing, and 2 wires from a plunger switch by the door. One of those wires was chewed nearly through, but neither of them was connected to anything. There are 2 plunger switches on my door; one works the interior light, the other which is what those 2 loose wires are connected to... what is that supposed to go to? Anyways, since I had to pull the speedo because of a flutter in the needle, I went ahead and pulled the tach and speedo. 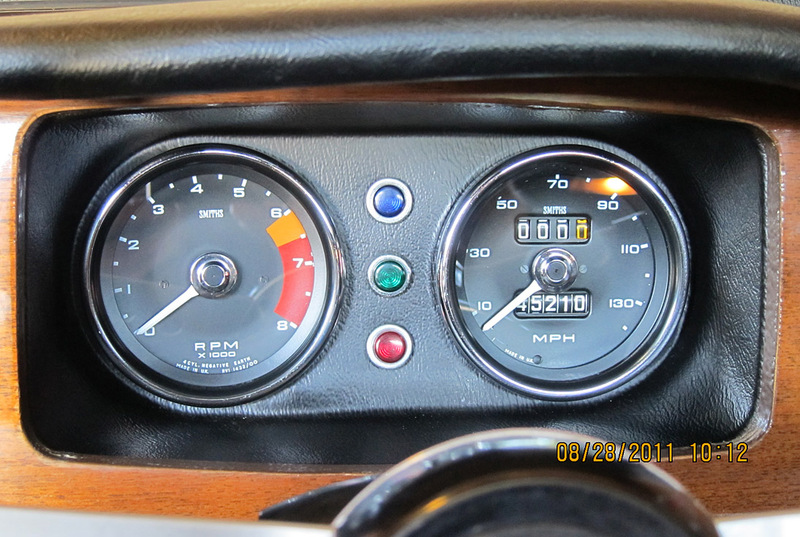 The tach only has one clamp; one is missing. The speedo has both. When I pulled them out and took them apart, there was a fine grey dust of some kind coating the inside of the housing, and a sort of haze on the inside of the glass. I cleaned out the inside of the housings to remove the grey dust from the white paint, cleaned the bulbs and made sure they had good contact. I used Nevr-Dull to clean the chrome and cleaned the glass thoroughly. Now the instruments look like new and the lighting is decent. Definitely an improvement. I also found what looked like black junk of some kind on parts of the gearing in the speedo mechanism. I cleaned the gears and put a drop of 3-in-One oil on them and everything seemed to move freely. I didn't finish until too late to do a road test but hopefully the needle flutter is now gone. I cleaned the dash housing that holds the speedo and tach and that whole area with the cleaned instruments looks pretty darned good now. The glass on the instruments is so clean you can't even tell there's glass there unless you shine a light on it. I'll take a picture tomorrow when I have some daylight and can take a pic without flash. Could it be for an after-market alarm system ? Rather than tap into the Lotus electrics, an alarm fitter might just have installed a separate switch. Or of course it might just be a previous owner has installed a home-made system of some sort. The auxillary instruments aren't that bad to get at if you have thin arms. It's better if you have the radio & glovebox/instrument binnacles out because you can see more of what you're trying to get to. I'm sure you'll find the same thing - dust from old age and tarnished connections. Here's a shot of the back of the tach when I first pulled it out; the fine grey dust you see on the outside was also on the inside. Here's the way the major gauges look now all cleaned up; didn't take a pic before which I should have. I hope both of these next shots are viewable; I took them in the dark with just the dash lights on. This first one is the tach and speedo and is pretty accurate as to how they look to the naked eye. This next one is of the 4 minor gauges. The ammeter on the left is pretty good as is the temperature gauge 3rd from left. The oil pressure gauge 2nd from left is the weakest and the fuel gauge on the far right isn't much better. If I can get gauges 2 and 4 to look like 1 and 3 I'll be happy. Brian; good idea about pulling those items to give better access. I also have a radio in the way which would probably help to pull out. I notice the ammeter is showing discharge so I'm guessing that you'd find the gauges a bit brighter with the engine running, the alternator charging and the battery supplying a healthy 12v+. I'm sure a good clean will get the minor gauges looking identical, from what I can see in your photos there can't be a lot wrong there. I'm just putting the interior back together on my car after respraying it and oddly enough I've decided to pull out the gauges & switches to give the interior a bit of sparkle. The spare "plunger" on the driver's side door is for the key warning buzzer, which soounds if you open the door and the ignition key is still in the lock. Yeah that's what I'm thinking too; a good clean and bright should do the trick. It's true that shiny chrome bezels and sparkly clean glass do add a nice effect to liven up the interior so it doesn't look so old and drab. Ah! Thanks Roger! I'll have to track that down on the wiring diagram. I don't even know if the buzzer unit is still in the car but there's 2 wires from the switch and a loose ground so it makes sense that's what they're for. Well I did a road test tonight. Everything worked. The speedo still has a slight amount of bounce intermittently but nowhere near as bad as it was. Before I cleaned it the needle was bouncing a full 10 mph almost once a second. Now it intermittently bounces maybe 3 mph and it's not constant like before so cleaning it did some good. Now I need to check the other end of the cable at the trans. I'll clean and lube that and maybe, just maybe the speedo will settle down enough to be usable. The lighting of the tach and speedo is pretty good now. I think if I can clean the 4 minor gauges the same way everything will be good. Found the buzzer on the wiring diagram but I don't know what the actual unit looks like. Anybody have a picture of it so I know what to look for? Got a new hose to replace the one coming from the thermostat housing since the old one had a small crack starting to show. Had to cut the old one off with a knife; it had been on there a long time. Whoever originally put the thermostat in had put some kind of orange, rubbery sealer on it which had squeezed into the insides and was on the actual thermostat. Removed all that, cleaned everything. The thermostat itself is in pretty good shape; just a little cleaning was all I needed to do. No rust on it which was a good sign. 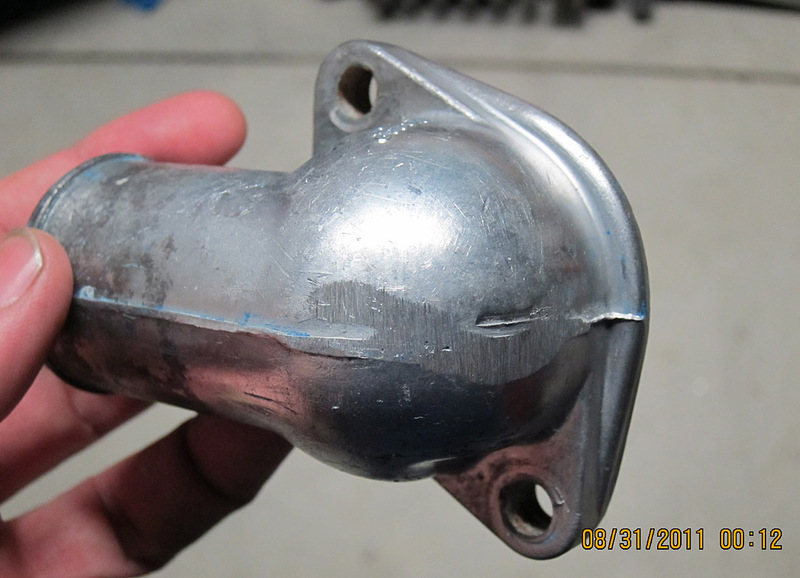 I stripped all the paint off the thermostat housing and unfortunately the casting is pretty rough. I was planning on just polishing it and not painting it again. But now that I see the condition it's in, I have to decide whether I want to put in the time to grind and smooth it first before polishing; paint it again; or just replace it with an already finished housing. Great Progress, and it looks very good! As for my progress it has been slow, but I have done some things. School started back up, so I don't have much time anymore, but every time I get a chance, I do something. Hopefully I get the body off this weekend, and get the suspension done. Than the brakes. Thanks! You'll get there; just be persistent and take it in small "mini" projects and over time you'll see it all come together. Been playing around with trying to get better dash lighting. 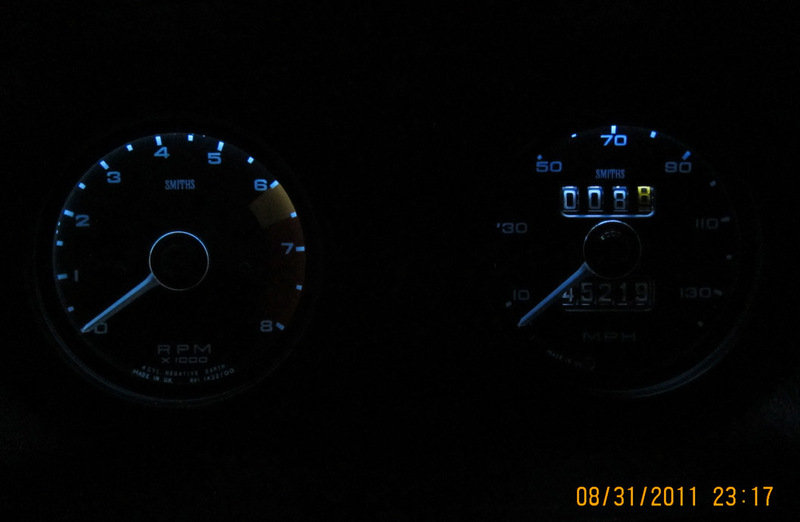 I got some LED's which I put in the tach and speedo. They are a bit brighter but I'm not crazy about the bluish color. These are supposed to be the "super white" LED's. 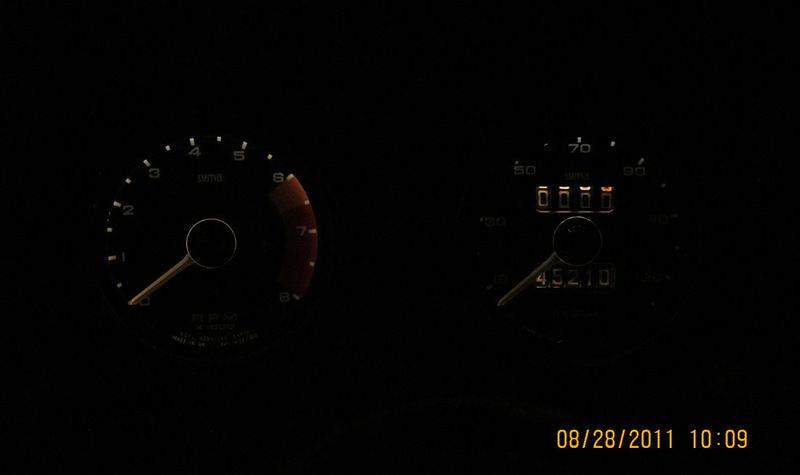 Here's a shot comparing the speedo with the Ammeter gauge which is still the stock incandescent bulb. 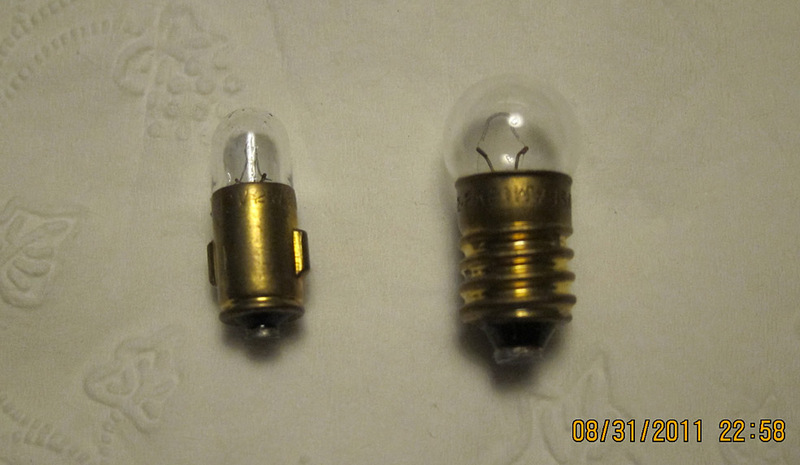 Here's both bulbs that are used in the dash; the small one on the left goes in the 3 indicator lights between the tach and speedo, and the bulb on the right is in all the instruments. 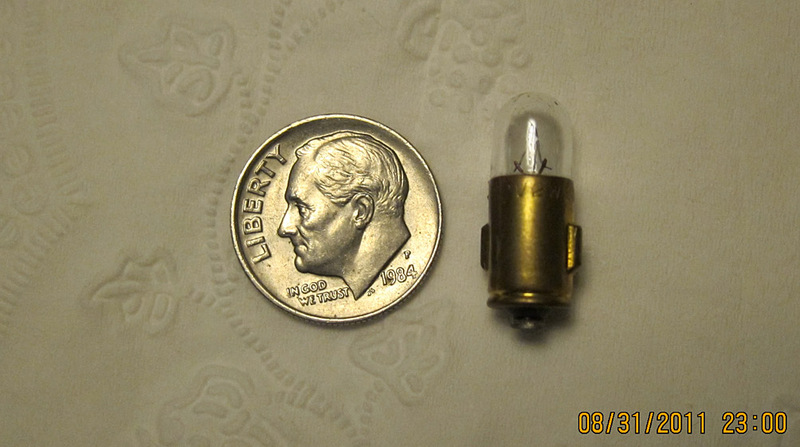 Here's a pic showing how small the bayonet style bulb actually is. I don't know....somehow the bluish color just looks out of place with a car this old. I actually like the warmth of the stock incandescent bulbs better. It looks like these LED's are in the 6000k color temperature range which I'm not a fan of. I'd prefer something around 4800k-5000k. I think I'll do some more searching to see if I can find an LED that's in the color range I want, otherwise I'll stick with incandescents and see if I can get brighter bulbs. I feel exactly the same as you. My instruments are aftermarket, and I wanted the lower current draw of LEDs ( I'm using a solid state dimmer, 2 amp max) but I hated the "blueish" color. In the yahoo group > photos> 0323R; you can see a similar comparison. I did a bit of experimentation with "stained glass paint" in Amber, on the LED's & got pretty good results, nice color, & plenty bright. However, the speedo lamp does not lend itself to a LED swap. Thus, there would be a miss match in illumination. I still haven't made up my mind how to proceed. 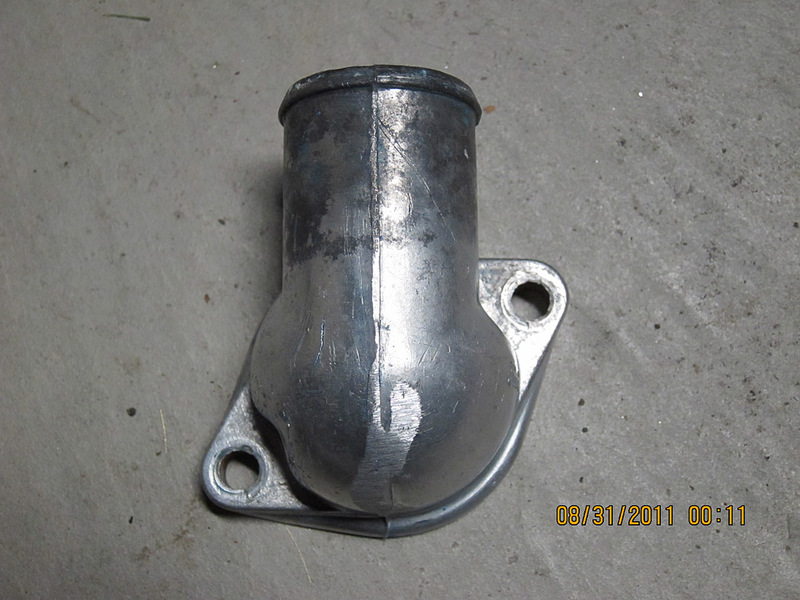 Perhaps I missed it, but how did you solve the problem of the header stud? Your thread and Tuscan's are just amazing. I found leds to fit all the instruments, used some in the main (tach, speedo) that had 5 leds in each "bulb". The color was unbearable though. Yeah I like the idea of the lower power draw of LED's too but like you guys I just don't care for the color. An old world dash and instruments with new world lighting just doesn't look right. If I can't find an LED solution that looks good I'll just switch back to incandescents. I'll post up whatever I can find. I pulled the fuel gauge and it came apart fine; cleaned it and it looks like new now. I can see a slight haze on the inside of the glass of the oil pressure gauge, and in fact all the gauges have had it. Cleaning the insides and the glass really makes a difference in how they look. No I haven't fixed that yet. After looking at it carefully though I believe the trick of pulling the header flange back until it's almost off the stud will allow me to get the nut on and then I can walk the headers forward as I tighten it. Right now I'm just doing various other things for some variety. It gets a little tiresome staring at the same part of the car for too long lol. Took care of the thermostat housing. I decided rather than spend a lot of time on it I'd just paint it so I got some Ford Gray engine enamel and painted it. 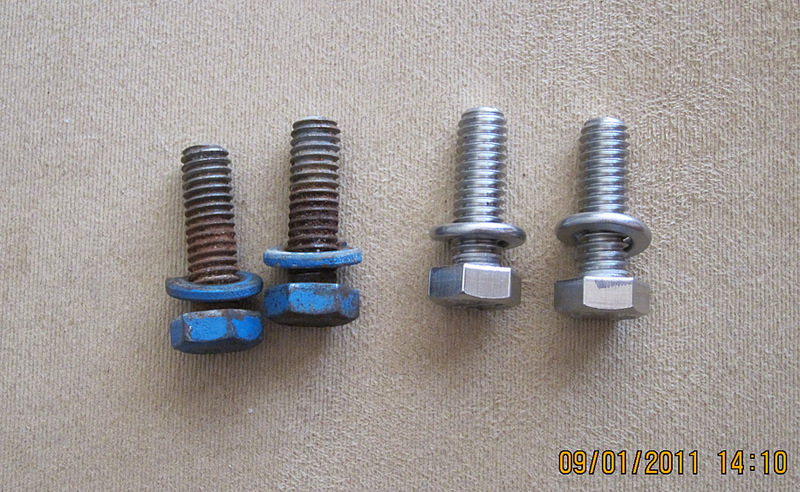 Replaced the rusted bolts and washers with new stainless steel ones. The bolts are 5/16-18 x 1" long for anyone who's thinking of replacing them, and I got them at Home Depot for 43 cents each. 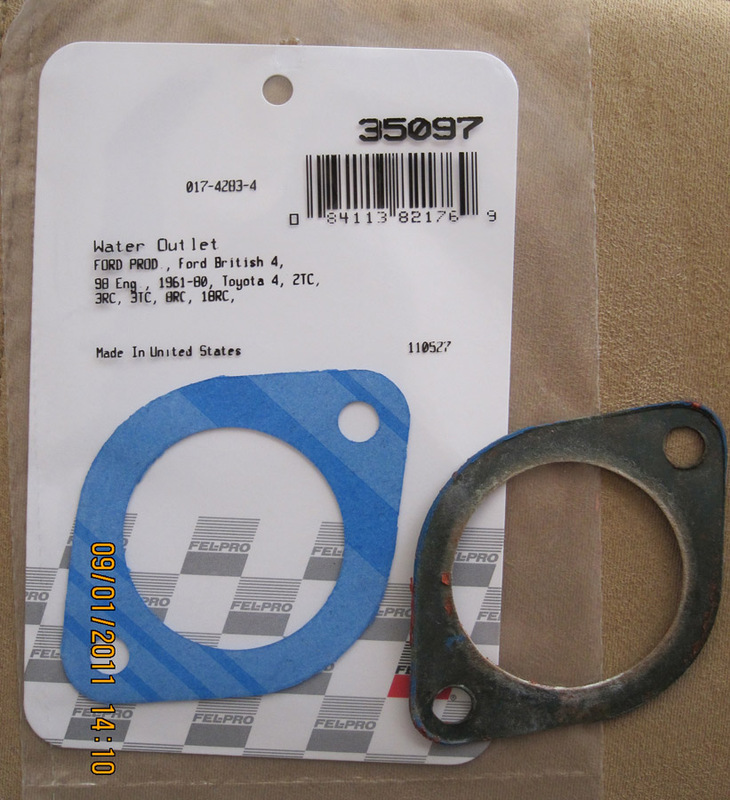 Went to Autozone and got a new thermostat gasket. They have a generic one which is the right size for the holes, but just a tad large on the outside. I put the housing on top of the gasket and traced around it with a mechanical pencil, then used a pair of good scissors to trim away the excess and it fit perfectly. 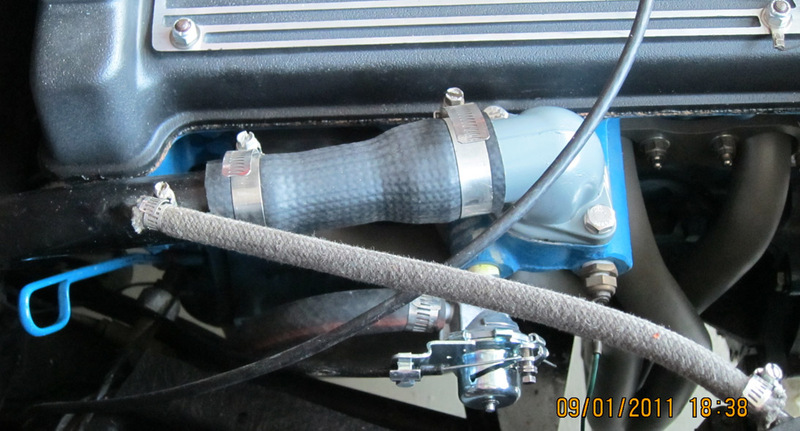 Here's the housing newly-painted and installed, and the new hose as well. 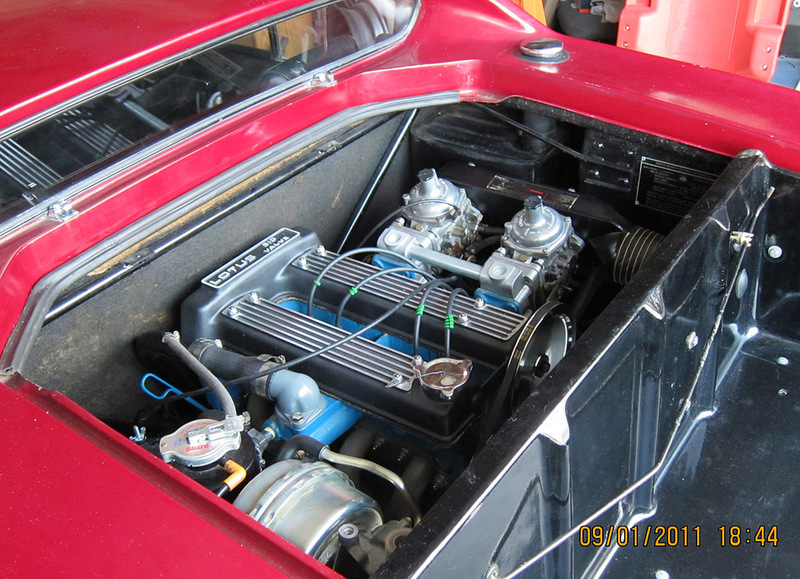 A long view of same; the engine compartment is starting to look pretty decent.